The DTX542K features all DTX-PADs for snare and toms plus our exclusive 3-zone hi-hat pad as well as 3-zone choke-able ride and crash cymbals. 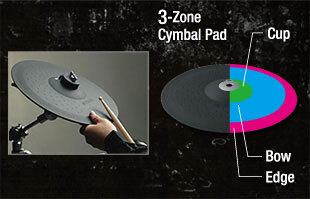 The DTX522K also features our professional 3-zone cymbal pads, which can express a different sound in each of the cup, bow and edge zones. These cymbals have a good stick feel and low acoustic noise, which is essential for electronic drums when used for private practice. In addition to a very natural swaying motion, they also have the “choke” function 360-degrees around the edge. 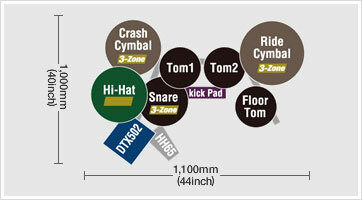 You can even mute the cymbal before striking it – a DTX exclusive feature!